z-Old Categories Android Facebook Messenger to get a new look? 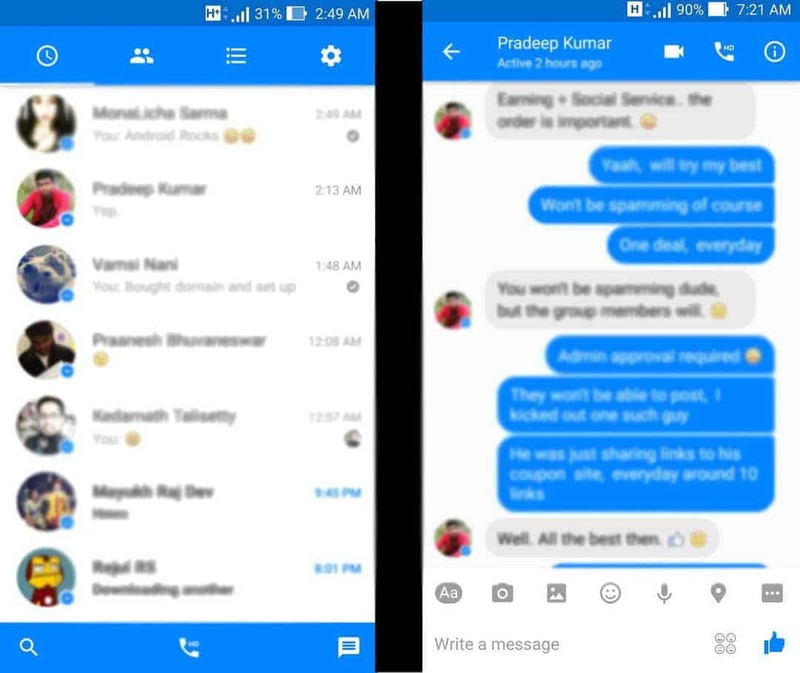 Facebook Messenger to get a new look? Facebook Messenger has been one of the best instant messaging apps, slowly improving over time. Earlier people used to rely on other third party apps [Check those here] over the official one. And also, when Facebook forcefully tried to implement Messenger and removed the chat feature from their official app, may of you probably have been frustrated a lot and we came up with something which would let you chat from the Facebook app itself. But now, time has changed. According to a report, in December 2015, facebook Messenger had got 800 million monthly active users, well that’s huge. But, Facebook Messenger has got pretty average rating on the Google Play. Yes, there are some issues which still needs to be fixed. And I can understand that as facebook pushes at least three updates per weed, but this time I got a little surprised as I just noticed a sufficient amount of change in the look of the Messenger app for Android. And this is how the Messenger is gonna probably look within a few weeks or months. I was first surprised to see it as soon as I opened te app and then spotted the change in conversations as well. Later, I checked the version and it was 57.0.0.17.81. The another update was pushed and now, it reverted back to old style. As you can see from just two screenshots, the new look is quite flat and actually looks better than the current one. however, I’m not so sure why Facebook suddenly pushed the update to the beta testers and why after another update it reverted back to old style. But, definitely Facebook is working on something. Just yesterday, we got another interesting thing to know about. That was playing Chess on messenger within a chat. To start playing Chess just type ‘@fbchess’ in a conversation and strat playing. Also, you can just send cute pictures to your friends by typing ‘@dailycute’. Check the video below to know how. So, just have some patience and let’s see what happens. Also, staty tuned here and join us on Facebook to get instant updates about tech, gadgets, social media and much more.